The Greek military has consistently enjoyed strong fiscal support from the central budget much to the envy of its NATO peers and the consternation of Athens’ creditors. Since the end of the Cold War, military expenditure has never dipped below 2.3% of GDP; in the 1990s it hovered between 3% and 4%. One of the major acquisition projects funded in the last two decades was a recapitalization of the Hellenic Navy’s submarine force, which operated eight German-built U-209 variants at the time the program was launched. Returning to the German shipyards, the Greek government signed a deal in 2000 with Howaldtswerke-Deutsche Werft (HDW) and Ferrostaal for three new U-214 submarines and later exercised an option to purchase another. The EUR 1.26 billion contract, however, was later found to have been made possible by EUR 100 million in bribes paid out to Greek defence officials and various consultants. A third firm, STN Atlas, paid up to EUR 13 million in bribes to ensure its sensor systems were installed onboard the new submarines. Akis Tsochadzopoulos — Greek Defence Minister (1996-2001); sentenced in October 2013 to 20 years imprisonment for money laundering. (The statute of limitations had passed for the corruption charges). Yiannis Beltsios — associate of Tsochadzopoulos; convicted of taking bribes and received an eight-year suspended sentence. Sotiris Emmanouil — managing director of Skaramangas shipyards; convicted of accepting bribes, received a 20-year suspended sentence. Antonis Kantas — deputy head of procurement, Greek Defence Ministry; received leniency for admitting bribe-taking and for airing allegations. Received a suspended 10-year sentence. Was previously convicted and sentenced to a 25-year sentence for involvement in a communications bribery scandal. Jean-Claude Oswald — French banker; convicted of laundering bribes and sentenced in absentia to five years in prison. Panagiotis Efstathiou — an agent for Atlas Elektronik; convicted of bribery and received a nine-year suspended sentence. Johann-Friedrich Haun — senior manager of Ferrostaal; convicted of bribery, fined and received a suspended prison term. Hans-Dieter Mühlenbeck — senior manager of Ferrostaal; convicted of bribery, fined and received a suspended prison term. 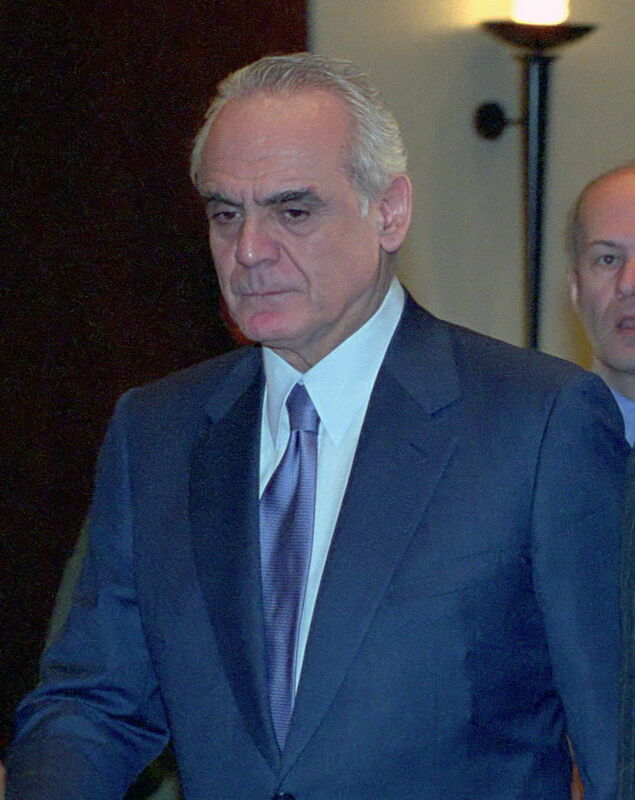 Former Greek Defense Minister Akis Tsochatzopoulos. U.S. Office of the Secretary of Defense, Public Affairs Photo. The Greek navy’s search for new submarines came partially in response to the war-scare of January 1996, when Greece nearly came to blows with Turkey over the islet of Imia/Kardak. Later that year, Greece announced a USD 17 billion, 10-year acquisition plan. The subsequent submarine tender was met with bids from French, Swedish, and German firms, and a decision to select the German option was made in 1998. The perceived imperative to upgrade the Greek navy was paired with a concern to preserve the country’s faltering shipbuilding sector. Thus, the contract for new Type-214 submarines was married with a takeover of Hellenic Shipyards, a fiscally distraught concern, by the HDW-Ferrostaal consortium. The negotiators agreed to offsets as well, including provisions requiring HDW to help sell Greek products abroad, to transfer know-how to Greek shipyards, and to construct everything from rail cars to new ferries. After the first submarine was completed by HDW in Kiel in 2004, the Hellenic Navy refused to accept the vessel because of a long list of alleged defects. The Germans responded, arguing that the Greeks were attempting to stall payments. By 2009, the Greek government had spent EUR 2 billion on the program, with another EUR 500 million in arrears. In September 2010, the two sides agreed to a revised deal that expanded the program to acquisition of six new submarines; in the interim, three new vessels had been laid down at Hellenic Shipyards’ Skaramanga facility. The new agreement had barely been inked when investigations into the deal became public in 2011. In May that year, HDW announced that it would abandon the deal amendment. The last of the four submarines ordered in 2000 and 2002 was finally delivered in 2016. To secure the deal, Ferrostaal paid up to EUR 120 million in bribes to a large number of Greek officials, most notably the Minister of Defence, Akis Tsochadzopoulos, and Antonis Kantas, deputy head of procurement at the Ministry of Defence. An investigation in Germany into bribe-giving at Ferrostaal began in May 2010, and eventually was refocused on corruption associated not only with the Greek submarine deal, but also the sale of submarines to Portugal and a compressor station to Turkmenistan. Two senior Ferrostaal employees, Johann-Friedrich Haun and Hans-Dieter Mühlenbeck, were fined and received suspended jail sentences in December 2011, and the company itself was fined EUR 40 million. A parallel investigation into HDW was reportedly dropped due to lack of cooperativeness from Greek authorities. Greek investigators with the Financial Crimes Squad (SDOE) went public with their findings in March 2011, and initially suggested that 37 people had been contacted by a prosecutor about their role in the submarine deal and that EUR 100 million in bribes had been distributed. The investigation also claimed that the price of the submarines was inflated through requests for extra equipment, and that this inflation allowed for more bribes to be paid. The total estimate of bribes paid was later increased to EUR 120 million. The parallel Greek investigation netted its most prominent conviction in October 2013 when former defence minister Akis Tsochatzopoulos was found guilty of laundering the bribes he received in connection with the submarine deal as well as a separate purchase of Russian missiles. Family members and associates of Tsochatzopoulos were also convicted in the trial. Antonis Kantas, the deputy head of procurement at the Defence Ministry at the time of the submarine deal, began cooperating with prosecutors in 2013 as well, and eventually provided information that led to the indictment of 32 individuals associated with the deal in March 2015. Kantas’ testimony hinted at the purposes of the bribery—to overcome the opposition of officials who felt that the spending spree Greece pursued after the 1996 crisis was either ill-advised overall or poorly executed in selecting equipment appropriate to the Greek military’s needs. In January 2019, a court convicted Sotiris Emmanouil, the banker Jean-Claude Oswald, Kantas, and other defendants for taking and handling bribes in the submarine deals. Most of the defendants were handed down lengthy suspended sentences, including a 20-year sentence for Emmanouil. Oswald, who did not appear in Greece for the trial, was sentenced to five years in prison. Ministry official Spyros Travlos and several other co-defendants were found to be innocent. In January 2014, a Greek agent who had worked for STN Atlas, a German electronics company controlled by BAE Systems and Rheinmetall at the time the submarine deals were signed, implicated the firm in the corruption scandal as well. According to the agent, Panagiotis Efstathiou, STN Atlas paid up to EUR 3 million in bribes to ensure its ISUS 90 sensor suite was installed on the Greek submarines. After an investigation, the Bremen Public Prosecutor’s Office announced in June 2017 that it had established that Atlas Elektronik GmbH, the Bremen-based successor to STN Atlas’ naval systems division after a split in 2003, had paid as much as EUR 13 million in commissions related to the deal. Atlas Elektronik, which is now jointly owned by Airbus and ThyssenKrupp Marine Systems, agreed to disgorge EUR 48 million in profits stemming from the Greek deal and a separate investigation involving the sale of torpedoes to Peru. The Bremen Public Prosecutor’s Office noted that investigations into the personal liability of 17 individuals would continue despite the settlement. Efstathiou was sentenced in January 2019 to a nine-year suspended prison term. Image Caption: The Greek submarine S-111 HS Nirefs, a Type-209 built by HDW and launched in July 1971, passes Agkistri, Greece, in June 2008. Image Source: Flickr/Creative Commons, Leonidas Konstantinidis. Sources currently report payments to Thyssen Krupp Marine Systems, who acquired HDW in 2005, of almost €2 billion, but also accumulated payment arrears of €524 million ($770 million): €300 million claimed by Hellenic Shipyards SA, and €224 million owed to HDW. “BAE SYSTEMS Awarded Contract To Supply Link 11 For Greek Submarines,” Defense Daily International, Vol. 3, No. 4, Jan. 24, 2003, accessed through Nexis. Defense Industry Daily, “The Odyssey: Greece’s U-214 Submarine Order,” last updated Oct. 8, 2014, http://www.defenseindustrydaily.com/greece-in-default-on-u-214-submarine-order-05801/. Jörg Schmitt, “How German Companies Bribed Their Way to Greek Deals,” Spiegel Online (online), May 11, 2010, http://www.spiegel.de/international/europe/complicit-in-corruption-how-german-companies-bribed-their-way-to-greek-deals-a-693973.html. Miller & Chevalier, “Ferrostaal Settles Bribery Cases with Germany,” FCPA Winter Review 2012, Jan. 6, 2012, http://www.millerchevalier.com/Publications/MillerChevalierPublications?find=71404#ferrostaal. “Greece says German company executives implicated in defence kickbacks case,” BBC Worldwide Monitoring, Jan. 3, 2014, accessed through Nexis. Suzanne Daley, “So Many Bribes, a Greek Official Can’t Recall Them All,” The New York Times (online), Feb. 7, 2014, https://www.nytimes.com/2014/02/08/world/europe/so-many-bribes-a-greek-official-cant-recall-all.html. “Three ex-ministers identified over submarine deal,” Ekathimerini (online), Feb. 27, 2011, http://www.ekathimerini.com/132193/article/ekathimerini/news/three-ex-ministers-identified-over-submarine-deal. “Submarine bribes reached 100 million euros, report says,” Ekathimerini (online), Mar. 27, 2011, http://www.ekathimerini.com/132733/article/ekathimerini/news/submarine-bribes-reached-100-million-euros-report-says. 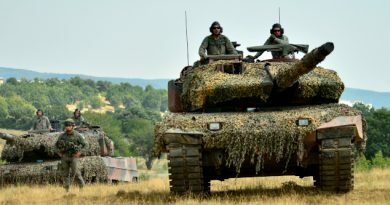 Nick Amies, “Probe into German-Greek arms deals reveals murky side of defense sales,” Deutsche Welle (online), Aug. 12, 2010, http://www.defense-aerospace.com/article-view/feature/117242/germany-probes-greek-arms-deals.html. “Greece Makes Progress on Arms Deal Corruption,” Spiegel Online (online), Jan. 20, 2014, http://www.spiegel.de/international/europe/greece-arrests-two-suspects-in-submarine-bribery-case-a-944446.html. Wolfgang Reuter, “A Greek Tragedy: Should the EU Save Athens from Bankruptcy?” Spiegel Online (online), Dec. 14, 2009, http://www.spiegel.de/international/europe/a-greek-tragedy-should-the-eu-save-athens-from-bankruptcy-a-666886-2.html. Natasha Marie Levanti, “Greek Defence Corruption,” European Public Affairs, website, May 19, 2014 http://www.europeanpublicaffairs.eu/greek-defence-corruption. A. Makris, “Thirty-two Indicted Over Kickbacks for German Submarines Contract,” Greek Reporter (online), May. 26, 2015, http://greece.greekreporter.com/2015/03/26/thirty-two-indicted-over-kickbacks-for-german-submarines-contract. Christopher Rhoads, “The Submarine Deal That Helped Sink Greece,” Wall Street Journal (online), July 10, 2010, https://www.wsj.com/articles/SB10001424052748703636404575352991108208712. Klaus Ott and Tasos Telloglou, “Verdächtige in Athen festgenommen” [Suspects Arrested in Athens], Süddeutsche Zeitung (online), Jan. 19, 2014, http://www.sueddeutsche.de/wirtschaft/geschmierte-ruestungsdeals-mit-deutschen-firmen-verdaechtige-in-athen-festgenommen-1.1866170. “Staatsanwaltschaft Bremen erlässt Verfallsbescheid über 48 Millionen Euro gegen Atlas Elektronik GmbH,” press release, June 1, 2017, available from https://www.staatsanwaltschaft.bremen.de/sixcms/media.php/13/Nr%20%205%20.5468.pdf. Did you notice that an argentine subsidiary of Ferrostaal was the one that “repaired” the now missing ARA San Juan submarine? The repair itself was done to the battery bank, its failure being suspected to be the cause of the loss of the submarine. Interesting, and not entirely surprising.